Margarita Martin is the energy behind the Colombo-American Education Foundation, "We need to educate children who will build a future for Latin America. The solution to the drug war is to provide educational opportunity. 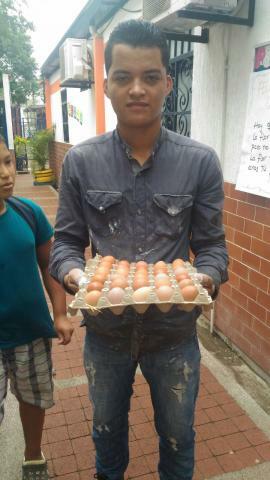 By educating the young people of Colombia, they can build a life in their country and give hope to their neighbors." Martin, who now lives and works in Orange County, came to California on a student exchange program. She went to school, married and settled in the United State, but never deserted the children in need of education in her home village of Neiva, Colombia. Martin's heart-to-heart project is deep in her ancestral heritage. Martin's grandfather, Reinaldo Matiz, was a humanitarian and important political leader in Colombia at the turn of the Century. Matiz founded factories, established a newspaper, started the local postal service, and developed the first electrical plant in his native village, just outside of Bogotá. The government of Colombia in Neiva gives a prestigious journalism award, in his name, annually. "Schools in Latin America are not free. Students must pay tuition of about $760 for their education and books, said Martin. "We want to educate children who will stay in their country and help others". Mrs. Martin visits Colombia every year to check the academic progress of the sponsored children. Her good will mission creates an important link between Colombia and the United States. Martin believes that if she raises the annual tuition funds to pay for deserving students, she would create a bright future for the children of Colombia. CAEF extends scholarships to the students of the Reinaldo Matiz Trujillo-Boys & Girls Club at the Orphanage “Casa del Nino” in Neiva, Colombia helping hundreds of children of low economic means. The Orphanage has 300 students with teachers and professional assistance. In September 2009, Rotary member and President of the Colombo-American Education Foundation Margarita Martin (born in Bogota, Colombia and resident of Laguna Beach) spent six weeks in Neiva, Colombia, developing the first after school program “Boys and Girls Club” – Reinaldo Matiz Trujillo” and a two computer technology classrooms. The Lab is open to other schools and the community with the hope of teaching computer literacy to a wider range of students. At the front door of the Computer Lab is a marble plaque dedicated to "The Lost Children of Colombia Killed by Violence”. The Foundation through the Boys & Girls Club after school program plays an important role in fighting drug use and poverty through education. Without a solid education, the streets of any town in Colombia will become a business opportunity of drugs for a child without the basic education of reading, writing, and math skills. This country is at the edge of succeeding, but the history of drug wars and supplying guns for drugs has created a market of death. The guns that are left in Colombia, as payment becomes a death sentence to those children that are unable to break the bond of poverty through education. It is unfortunate, but the reality is without the help of the most influential citizens of the world, the children of Colombia will fail. Without your assistance, the children of these small communities will end up on the streets in the large cities working for the gang bosses that are giving guns to create havoc. With all the billions of dollars that governments are spending on eliminating the drug cartels, the cost of education is being ignored. If you believe as we believe, "The most important investment is education", then we, as a concerned group, can break the cycle that is destroying Colombia, the United States and the world. The Colombo-American Education Foundation is seeking funds to increase the number of scholarships for underprivileged Colombian children, thus encouraging and providing the means for a better life. It is through the "hope of education" that these future leaders of Colombia will increase the value of their communities and solidify international ties to the United State. 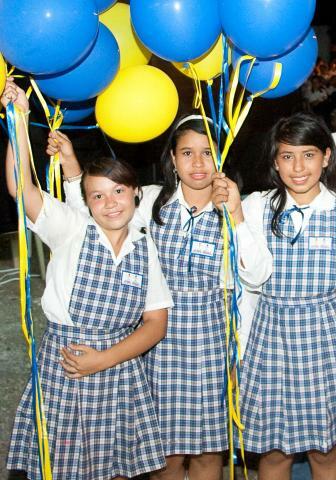 The cost to provide a scholarship for an impoverished Colombian child is $380 to $760 a year. This includes the enrollment fee, tuition, uniforms, shoes, books, and educational materials. The after school program “Boys & Girls Club” Reinaldo Matiz Trujillo is presently looking for sponsors for its educational courses such as computer technology, ,reading & writing, arts ,sewing classes, courses in bread baking, electricity and computer maintenance.